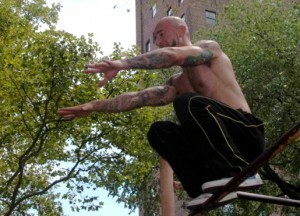 Parkour involves strength, agility, quickness and grace. 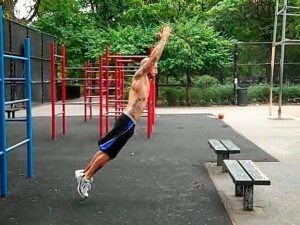 Precision jumping is a fundamental parkour move that encompasses all of those traits. I first learned of precision jumps when I was beginning parkour this past winter and I’ve been practicing them ever since. As the name implies, this skill is about leaping onto a small target (often a ledge or rail) with the utmost accuracy. Precision jumps are typically performed from a stationary position, with both feet together during the take off and the landing. You can precision jump between two points of equal height, from high to low or from low to high. 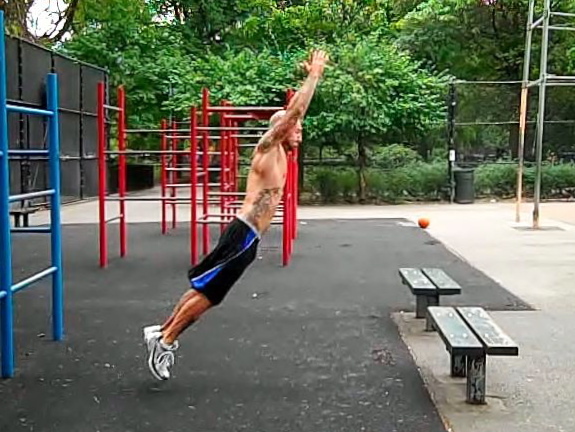 Jumping from a lower surface to a higher one will make it harder to cover long distances, while jumping down will allow you to cover a greater distance (though downward precisions can be harder to control). To get the most distance out of your precision jump, lean forward from your ankles while reaching your arms up and away from your body. Once you are in the air, bring your legs up to get as much height as you can. More height means more distance! Keep your eye on your target and remember to sink into the landing like you were performing a squat – this will help you absorb the impact. For this reason it is common to land towards the balls of your feet. Your objective should be to have as quiet of a landing as possible. Precision jumping, like most things, is about your mental state as much as it is about physical fitness. It can be scary to attempt a long jump (especially if you are high up! ), and if you psyche yourself out, you probably won’t make it. It is best to begin practicing with distances that you can cover without any hesitation. I watched a parkour video a couple months ago and have been very interested ever since. Have I been out there doing it? No, not yet,I have been busy but I will! Looks like your getting the jumping down real good. How is your dive roll? Luckily I have that one down due to my black belt in Tae Kwon Do, and here I thought I would never use martial arts…lol. What are you waiting for? Give it a shot already! Finally. I always found this type of training challenging and fascinating. During my years in the Army when I finally was able to lead a team we trained using some Parkour methods. Now I don't know any of the specific names but we just used moves that we would need for the field like jumping from one building to the next and landing safely while using our momentum to dissipate the impact. This type of training truly builds self confidence but more importantly awareness of your surroundings. I love Parkour b/c it takes every bit of mental and physical concentration available in order to not only be successful but not kill yourself. Take your eyes off the prize for a split second and you'll get a rude introduction to the pavement. Thanks for sharing, Matthew. You definitely don't want to take your eyes off your target when doing precision jumps! Try lifting your knees higher – it will feel weird at first, but it means you are landing downwards on it rather than forwards (I explained that really badly) so is easier to balance in the end. But still really good, especially for 2 months! Thanks, David. That’s definitely something I need to work on. I could probably add a foot on my distance if I could get my knees up more. Gotta keep practicing!